Invisalign is a clear solution to traditional metal braces and it is the perfect solution for individuals who want to straighten their teeth. Whether you received orthodontic care as a child and the results never stuck or you never received care and now is the right time, the team at Thornton Town Center Family Dental can help. We are committed to working with you to provide you with the best treatment options that not only fit into your budget but provide you with the beautiful smile you have always wanted. In addition to our orthodontic treatment options, we do offer cosmetic treatment options to include smile designs, veneers, ceramic and porcelain crowns, teeth whitening, and more. Your perfect smile is only a call and consultation away. If you are new to orthodontic treatment, then you may have never heard of Invisalign as an option. Most people know about the traditional metal braces option, but there is a clear solution known as Invisalign. This treatment method consists of custom-made aligners that are designed to fit your mouth properly and hug your teeth to apply just the right amount of pressure to them. 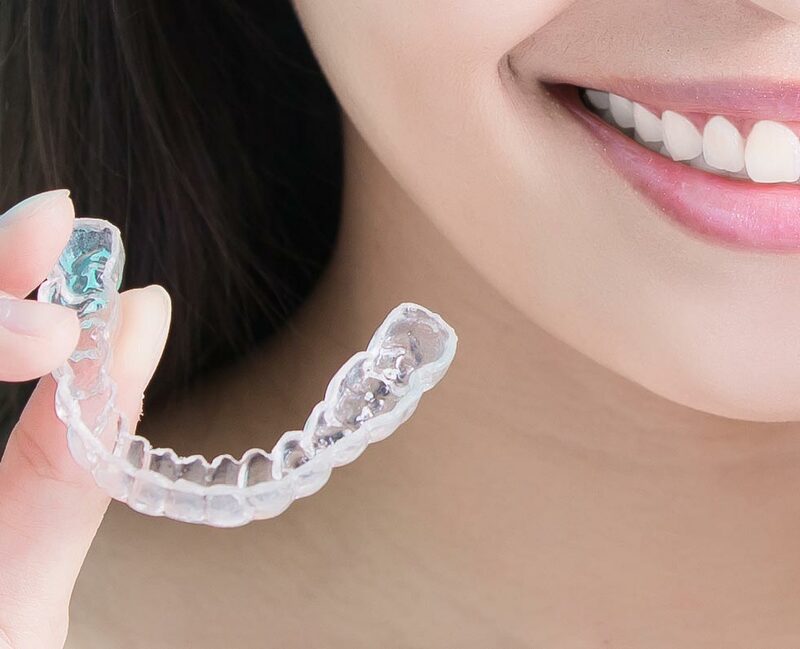 The aligner tray is made from a smooth, comfortable, and clear plastic that conforms to your mouth’s shape and it sits over the top of your teeth. The aligner is made special so that it does not cause you to gag or experience any type of discomfort. You will likely forget that you even have it in your mouth once you are used to it. You can perform all of your normal daily activities without worry too. Each of the aligners in the treatment system will shift your teeth into place using slight pressure. You never have to worry about brackets or any type of wires in your mouth as this system eliminates them completely. One of the nice things about these aligners is that you can remove them from your mouth whenever you drink, eat, or brush your teeth, which makes them convenient. You will receive a new set of aligners every two weeks and you will continue to switch them out until treatment is completed. The results of Invisalign are permanent too. Now that you have an idea of how Invisalign works, it is time to talk about the actual treatment process to give you a better idea of what you can expect in our Thornton office. For example, you may want to know how many aligners you will need or how long treatment will take. These are all common questions we receive, and our Thornton orthodontists will cover them for you. If you do have any questions, now is the time to call our office. The very first step in the process is to schedule an appointment with one of our orthodontists. This appointment will provide you with the opportunity to discuss Invisalign in depth and learn more about it. You will have the chance to ask any questions that may be on your mind and have our orthodontists address your concerns. Our orthodontists will ask you some questions too about your teeth and what your goal results are. This allows us to make sure Invisalign is the perfect choice for you. It is important that you work closely with our team, so that you can achieve the EXACT results that you want. Our orthodontists are experienced in Invisalign and they know how it works. You should only work with someone experienced as your teeth can become crooked or damaged with improper treatment. At your consult, you will be told if you are a good candidate for the aligners. If you are not, other options will be discussed with you at the time. After you are determined to be a good candidate, you will then have a formal exam completed, which will include x-rays of your mouth and teeth and impressions of your teeth. A digital 3D image will be created and once the image is ready, we will show you what type of results you can expect from the treatment. At this time, you will also learn more about how many aligners you will need to complete treatment altogether. It is important that you do not rush the process because it will take time. In fact, most patients complete treatment in a year with some completing treatment in as little as 6 months. The impressions will be sent out to a lab to be created and when they come back, you will be fitted with them to ensure they fit properly in your mouth. From here on out, you will wear the aligners 20 to 22 hours of the day and only take them out to eat, drink, brush, and floss your teeth. If your aligners are uncomfortable, you need to call our office immediately as they may need to be adjusted. Every two weeks that pass, you will receive a new set of aligners to wear. You can ditch the old ones that you have been wearing. It is important that you make sure to keep these appointments because each set of new aligners helps straighten your teeth. If you do not follow through, you may lose the results you have already achieved, or you may not get the results you want. Once you reach the end stage of treatment, you will be able to take out your aligners and smile boldly with your straightened teeth. Our orthodontists will look over your teeth to make sure they are healthy, in the right position, and the results you wanted. If you want straight teeth, now is the time to contact Thornton Town Center Family Dental. We will work with you to discuss Invisalign and other treatment options that are available to you. We are committed to providing you with the best dental care in Thornton. Call us today to schedule your free consultation for orthodontic treatment. We Appreciate All of Our Thornton Patients! Thornton Town Center Family Dental would not be as successful without the support from all of our patients. We are proud to be able to serve the local area and thank you for all of the referrals you have sent our way! Below, you will find some of our recent reviews from Thornton patients! I had a million questions that I wanted to ask and they did an awesome job and answering every single one. And the staff do an awesome job at making me feel comfortable while they work on my teeth! ALL the Doctors and staff are extremely nice and very professional. The office is very clean and modern. They have all the latest technology and every one seems very skilled at what they do. I recommend this place for anyone who needs good and honest Dentist!